Gunpowder tea (Zhu Cha) is a common name for varieties of tea produced in Zhejiang Province, China. 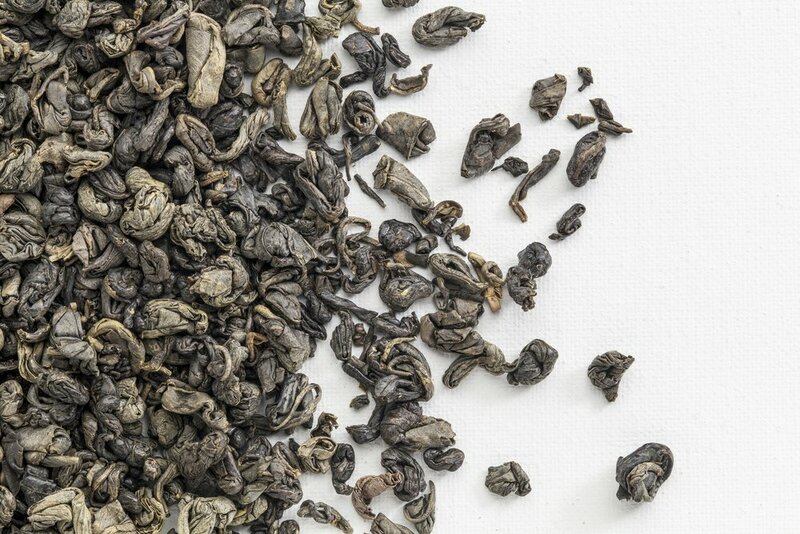 The tea gets its name from the appearance of its hand-rolled, pellet-like leaves. It also stays true to its name in terms of taste, offering a full-bodied, smoky feel and flavor that is retained within its tightly rolled leaves. Bold, powerful, astringent, slightly smoky. This one is higher in caffeine than most other green teas. It also has a well-balanced mix of notes to suit both coffee drinkers and green tea lovers. Green tea connoisseurs describe this as “earthy” and “bold flavored”, with a “surprisingly subtle sweet aftertaste”. The ‘practically’ inclined appreciate the fact that it’s always “good for an extra re-brew”. Gunpowder, together with spearmint leaves, is one of the two core ingredients of the refreshing and soothing Moroccan Mint tea. Traditionally, it is consumed with lots of sugar. Finest Gunpowder tea can be identified by small, shiny, tightly rolled leaves that preserve the flavor for greater lengths of time. In general, the smaller the pellets, the higher the quality of your Gunpowder tea. A smoky green tea made from rolled tea leaves. The rolled green tea leaves of gunpowder help to preserve the essence of the tea, providing a potent aromatic and flavorful experience sure to entice any green tea connoisseur.